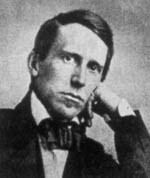 Stephen Collins Foster (July 4, 1826 – January 13, 1864), known as the "father of American music", was the pre-eminent songwriter in the United States of the 19th century. His songs, such as Oh! Susanna, Camptown Races, My Old Kentucky Home, Old Black Joe, Beautiful Dreamer and Old Folks at Home (Swanee River) remain popular over 150 years after their composition. Oh! Susanna, W.C. Peters & Co. (1848). I hear their gentle voices calling "Old Black Joe." Old Black Joe, Firth, Pond & Co. (1860). Lull'd by the moonlight have all pass'd away. Beautiful Dreamer, Firth, Pond & Co. (1862). My Old Kentucky Home. As quoted at Anthology of American Poetry, by George Gesner, (1983). My Old Kentucky Home. Reported in Bartlett's Familiar Quotations, 10th ed. (1919). A Stephen Foster Collection Songs with sheet music & midis, biographies etc. This page was last edited on 6 May 2018, at 19:32.